Make informed decisions by exploring our custom health tools and the latest health news. 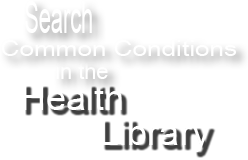 Search health, wellness, and medical information using the A-to-Z library of diseases and conditions. Select a region of the body to discover how associated symptoms relate to a condition or disease. Stay informed with the latest news in health, medicine, and fitness from around the world.